Since the online version of ClassRealm is still a ways off (though hopefully not too far), it’s only fair that I share my current ClassRealm documents with the teachers who want to give it a try in their classroom. This fantastic system can be yours for the amazing price of $0.00! (Please add $0.00 for shipping) Yep. Free. Why not? 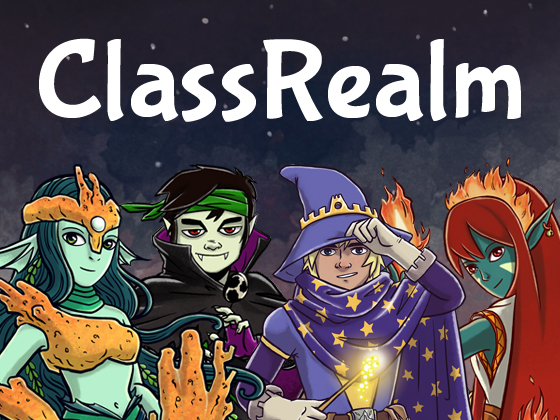 Maybe ClassRealm is what your students need to make this school year the best one ever. I’d be a terrible person if I denied them of that. So along with the documents I’ll try to give some tips on how best to use them. Note: ClassRealm works best if you add your own flair. It may not work exactly the way it works in my classroom. You may have to do some experimenting to see what your students respond positively to. – ClassRealm files have been updated with a bit more flare. – PDF versions of ClassRealm files have been added. Tips: It’s best to just type or write in your students first names in to the document I have provided, unless you know their last names well. You may find it hard to remember your new students full names, so just focusing on their first name makes things a bit easier. Write them in the first and last boxes (where it says “Name”) preferably in alphabetical order or by seating arrangement. This way you won’t have to trace their name all the way out from one side to their level when they get in to higher levels. You may notice that the sheet only goes up to level 18. If a students or multiple students exceeds this level then you’re going to have to renumber the document and print off a new one. Your students levels may range drastically, so always keep old XP sheets handy in case little Tommy is still stuck on level five while everyone else is in the thirties. I usually go seven XP to a level. I tally the XP in the level box and then highlight the box when they reach the seven. This is why there is a blank space next to each number. If you don’t feel this is sufficient room you can alter the document to your liking. Also feel free to make leveling up take more or less XP. Your class – your call. Attach the XP Sheet to a clipboard and carry it EVERYWHERE. Students go nuts for XP, especially when they get some out of nowhere for a seemingly natural response or action. Find a good balance. Giving out too much XP maks it seems worthless, giving out too little makes it seem to be an impossible goal. Once again, you may have to fiddle with your system before you get it working perfectly. Tips: Hopefully this one is kind of straight forward. Just have your students fill out all the sections and hold on to the paper. The “Full Title” section is the CR Moniker + Race + Enhancer. Example: Gorlog the Ninja Vampire or Smooty the Forest Elf. Strengths and weaknesses should be school and fantasy related. School ones can range from actual subjects to classroom behavior. Fantasy ones can be anything from an affinity for fire to a hatred of thunderstorms. Example: Strength – Math and fire, Weakness – Shouting Out and thunderstorms. The box to the right is for students to draw a picture of their character. Give them a little chunk of time to make them look nice and add some personal pizzaz. Students should be able to update their level as they gain XP. You may have to remind them, but it’s a nice way for students to see what they have already accomplished. Same goes for the achievements section, I’ll get to that here in a bit. When it comes to rewards I find it is better to give students a personal and collective goal to shoot for. Pitting students or genders against one another in over all competition can cause some unwanted tension between classmates. For this reason make the main goals a class wide reward, with personal goals also benefiting individual students while not hindering others. This way even your worst behaved, laziest student will contribute when he/she levels up. Adding to the group effort makes students push each other as well as themselves. When every level counts, every student counts. Feel free to change the rewards or the amount of levels needed to achieve said rewards. Make sure students hold on to these papers and update them often. Achievements are tricky. You want to make them accessible to all students, but also not a huge hassle to keep track of. The achievements I have included are the ones that work best with my class. Want to make ones that fit your class better? Do it! every Friday I write three riddles on the front board and students try to figure them out. This is how students earn the Puzzler achievement in my room. You may not do that, so you won’t want to use the Puzzler achievement. Attendance Achievement – The way the attendance sheet works is that a volunteer or assigned student will check each day to see who is present. A name only gets marked if they ARE NOT PRESENT. Remember, my achievement is based on weeks, so if someone is gone more than one day in the week you don’t have to mark their name twice. Figuring out how many full weeks a student has been around is as easy as counting the number of blank boxes next to their name. Behavior Achievement – My (extremely) simple sheet for behavior monitoring is simply to keep track of how students do on a week to week basis. The challenge is for students to make it the whole week without getting in trouble. If they do get in trouble you can mark out their box for that week. How do you know how many weeks a certain student didn’t get in trouble? Once again, count up all the blank spaces. Level Achievement – Just look up their current level and see if they have hit the mark. Easy! Reading Achievement – After a student is done reading a book they have to fill out one of the ClassRealm Book Overview sheets. It’s pretty straight forward and you should get a good sense of if they have actually read the book. I usually give 2 XP per Book Overview turned in. Writing Achievement – Make sure you are clear on how much you want students to write when it comes to this achievement. This was by far the most popular achievement I dealt with last year. You don’t HAVE to read every single story/essay turned in to you, but make sure to give them a once over to make sure students aren’t taking you for a ride. Tips: Random Encounter Friday is a small chunk of my Friday when students “battle” to win XP by answering grade level questions. It’s a great way to review! The main thing to remember is that REF is optional. Don’t force your students to the front of the class to be humiliated because they are a terrible speller. Here’s how it normally goes down. 3. I have 5 to 10 pre-made questions ready for battle. I tell them the subject. Example: Math. 4. For math questions I write the problem on the board while the competing students are turned away. 5. I que up some epic battle music (Usually Pokemon or Zelda). Once the students hear the music they turn and work out the problem on the board. 6. The first student to get done raises both hands. I stop the music and check their answer. If correct they gain 3 XP. If wrong then the other student has roughly 30 seconds to answer the question. If they get it wrong then I turn to the class for an answer. All students who come up get at least one point. This makes them feel good even if they fail. Most kids love the competition and thrive under the pressure. Once drawn, a students name goes in the trash. The best types of questions are math equations, spelling (repeat twice and have them spell on the board) and re-order questions (Ex: Put these planets in order from biggest to smallest). – The way you display all your data is up to you. You can make a web page, though that can be painstakingly hard to keep up with. Bulletin boards are nice, but once again someone needs to update it pretty much all the time. Just make sure you and your students have all their info recorded somewhere. – This version of ClassRealm is very bare bones and not very pretty. Make it your own. – ClassRealm has never been tested outside of my own classroom. You are the first to try it! – ClassRealm’s online interface is on it’s way! – ClassRealm MAY add to your work load and if it’s stressing you out too much you should dial it back. – I will try my best to respond to specific questions about the system. – I love to hear what has worked and what has failed. Please let me know! Sorry if there are any spelling or grammatical errors on this page or in the documents provided. I look forward to hearing form everyone who uses ClassRealm. I wish you all the best! 21 Comments on "Resources and Start Guide"
I absolutely love this concept, As a teacher-to-be I’m always looking for classroom management methods that promote active learning. Keep it up, hopefully it keeps expanding! I have an Advisory class of 7th graders. We do one lesson a week and it is not a graded class–it works on character building mostly. But they are terribly behaved. I’m going to test-drive this during the 2nd 9 weeks and see if it will get them motivated to do the right thing even though it’s not for a grade. Wish me luck! Good luck! I too have a rough group this year and they seem to be responding well to ClassRealm. Let me know how it goes. I’m going to try out your idea. I teach English in a primary school in Poland and I’m thinking of running a beta-testing in the 4th grade class. Hope it will work! Just found out about this a week ago, I wish I’d known during the Kickstarter project! Being in the last term of the year here (Australia), I thought I’d give this a test run in the class. So far the students absolutely love it! They especially love the idea of the classroom combined level rewards. All the students are trying to finish their work, and do it properly (Bonus xp is offered to those who do). Before this, we used to have a Jellybean reward at the end of the week if the class has been behaving and working well. This week, they’ve been asking if they could skip the jellybean and convert these as bonus xp. It’s only been 3 days in but I can already see the engagement level grow. They also loved creating their profiles. As a final note, this is a year 2 class. (Elementary grade 2 for America I guess?) I have also been thinking about gamifying the classroom since starting teaching last year and was absolutely delighted to have stumbled onto your site (albeit a bit late :() Thank you so much for this! I will come back and give more updates to this as more time goes on. I just wanted to contact you to thank you for posting your docs online. I’m a first year English teacher teaching 9th and 12th grade English at an Alternative school. I’ve been implementing CR since Christmas break and my Freshmen are STOKED to have me next year again for English. Why? Because Mr. B has already promised that he will be expanding the achievement list for the new year. Because I explained that over the summer I’d have a chance to work out a longer leveling system that will take them all the way to the end of the year their Sophomore year. What you’ve made is a system that has the potential to change the connotation of education. I can kill off the old terms. Terms that haven’t changed in almost 100 years! I can connect achievements to standards, and require students to have at least Bronze rank in each achievement by the end of the semester, order matters less in English. Sorry to gush, but you’ve made my first year so much better than it could have been. I know so many discouraged and disparaging teachers, man. That refrain, that, “Kids just don’t listen these days,” is like the patient that comes into the clinic coughing. To treat the illness we need to present students with content they WANT to listen to. This helps. Tons. Thanks so much, I hope you have a great weekend. I love this, and just set up my own version here: http://wordhammer.blogspot.com Cannot wait for school to begin! Thank you so much for creating this site and for coming up with the idea! I love this so much that I can’t wait to try it out on my students next year (currently teaching in Australia so it’s summer time here). I just have one question, what is the “Oops book” and how is that implemented in your classroom? Thanks again! The Oops Book is signed when ever a students makes a mistake. Anything from throwing an item across the room to forgetting their homework can result in signing. They have to sign in one of two columns – responsibility or respect. Hope that helps! Just a nice way for me to keep track of my students classroom issues. I read about ClassRealm in the alumni magazine from UIndy. I had been looking for a way to make my class a game (more or less) and discovered the concept of “gamification” three days before the school year started. I’ve been trying to get it started while teaching (7th grade social studies), but it’s slow going. Your materials will be very helpful. I’d love to see it at work in your classroom sometime. Thanks for the printed material. I’ll let you know how it goes. thinking of trying this on a class of 11 year old boys and girls. When filling in the XP and level sheet do you use their real names? 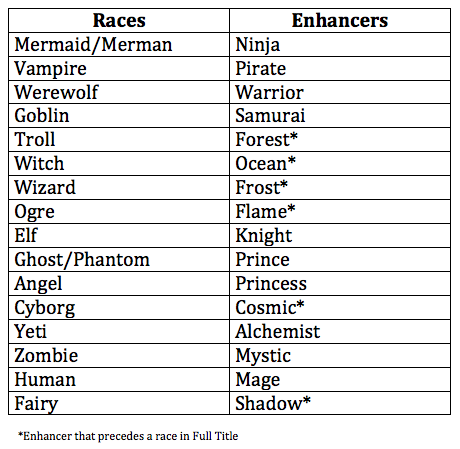 Also, when they choose their new moniker, do they get to choose the race and modifier (enhancer)? How do you ensure they don’t all pick the same race etc? I absolutely LOVE this idea and will be trying it the last 6 weeks of my 8th grade science class. I’ll keep you posted with the website interface that I plan to use but what you’ve come up with here is amazing! Just stumbled across this today. Pretty amazing. I am going to work on implementing this with my class I have next year. Awesome idea, thak you for sharing. Going into my 10th year as an Art Teacher in middle school, and having 50-60% of homework NOT turned in I think having a visual reminder of what they have achieved is important. I’m going to obviously tweak this to work in my class, but I think in Art this can work out well. Thanks for the free documents, looking forward to it. Hope you get this project up and running like you see it. I am super excited about this idea!! I will be teaching in the upcoming year, and I am huge fan of Skyrim in particular. I saw that the time was up for the fundraiser, and I wonder if Ben will still be pursuing the larger idea involving online access? The latest I have seen any updates have been from 2012. I hope it’s still in the works. Hey, glad to see resources here! I’m going to be trying to incorporate some of these systems into my own reading classroom. I’m happy to help with building the system. I have many questions, however the one on top is; what do the classes and modifier ACTUALLY do?? Are they there for just name purposes or do they have special powers which allows them to get badges and levels easier? ?